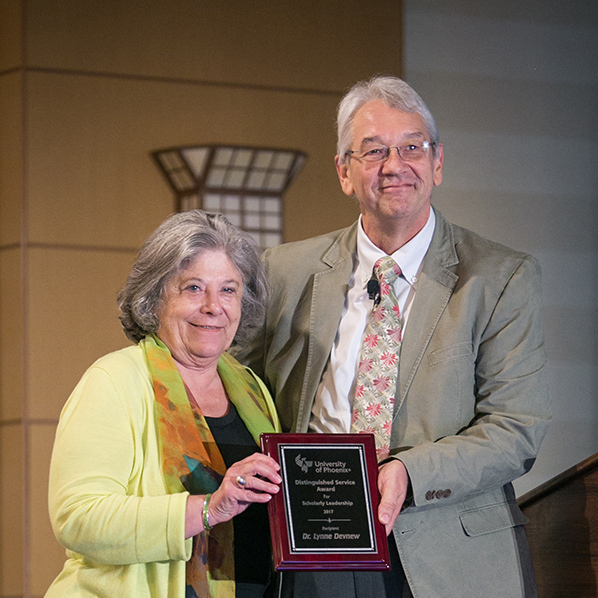 At the 2017 Annual Knowledge Without Boundaries Symposium earlier this month, Dr. Mark McCaslin announced the winner of the first-ever Certificate of Distinguished Service for Scholarly Leadership. The award was presented to Dr. Lynne Devnew, Senior Research Fellow for the Center for Leadership Studies and Educational Research. As noted in the presentation, the award was a recognition of Dr. Devnew’s successful demonstration of “unprecedented dedication in her role as distinguished Fellow.” Her research focus is on leader identity development and aspirations, particularly women and leadership scholarship. Her role as fellow for the CLSER has recently evolved into leadership of the newer Women & Leadership Research Group which works across all University of Phoenix research centers in support of women and leadership scholarship. This new group has given her efforts – and those with similar research interests – an online home. Outside of University of Phoenix, Dr. Devnew partners with many schools and Universities to bring awareness to her research focus. She also serves the International Leadership Association (ILA) in multiple capacities: she is on the Executive Leadership Team for ILA’s Women and Leadership Affinity Group (WLAG), and was the program chair for their 2017 event. Congratulations to you, Dr. Devnew, and thank you for your contributions to the School of Advanced Studies, University of Phoenix, and the greater research community!